Attachments work strangely. Without our knowledge, most of the time, we attach ourselves to a lot of things. We take them to be ours. We own it or constantly keep trying to. A feeling of possession rises within us. This obsessiveness always comes with a fear – the fear of losing – sometimes losing the whole and sometimes losing in parts. With this fear, comes sorrow and pain. Those were the days when I used to read and follow Ravi Belegere very feverishly. Every piece of article written by him in “Hi Bengaluru” and “O Manase” magazines, every one of his books published, anything and everything associated with him never used to go missed. It is through his writings I got introduced to writers like Jogi, Chalam, Malagaonkar, Ramachandra Guha, Ruskin Bond, William Dalrymple and many more. 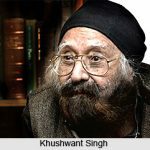 Khushwant Singh was one such writer I came across and got glued to since then. With each passing book, I got more and more interested towards his writing and towards the man himself. I got greatly impressed by his witty narrative, strong vocabulary, bold and straight forward writing.